February 28, 2012 - Acting Federal Aviation Administrator Michael Huerta recognized the Chattanooga Metropolitan Airport's leadership in energy saving innovation when he helped dedicate their new solar farm. This exciting development is on the cutting edge of making our airports more environmentally friendly. The solar energy the new "farm" provides will also help the airport cut costs. 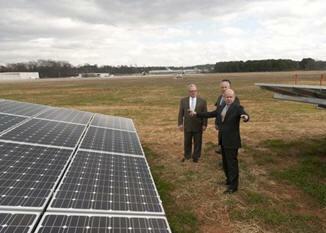 The FAA supported the 4.5 acre solar farm with a $4 million Voluntary Airport Low Emissions (VALE) grant. Chattanooga is only one of 52 green initiatives that the FAA has supported in the last several years to reduce greenhouse gas emissions at airports across the country. In addition, the airport?s new energy-efficient 9,000 square foot corporate flight center (FBO) terminal recently earned LEED platinum certification from the U.S. Green Building Council. Chattanooga is currently the only aviation terminal in the world to achieve this highest possible level of energy and environmental performance. Acting Administrator Huerta said, ?This solar farm and the LEED-certified FBO are examples of how to build America?s infrastructure so that it?s sustainable for years to come. They are innovative, clean energy projects that create jobs and that use American know-how to improve our economy.? Using nearly 4,000 solar panels south of the airport to generate clean electricity is an innovative step. It?s environmentally sound, and it helps improve the air quality in the Chattanooga area. The energy these panels produce will lower airport greenhouse gases such as carbon dioxide, and the amount of pollution reduced will be like taking 200 cars off the roads of Chattanooga each year. The panels also help the airport keep its energy costs in check, generating enough energy to run about one-third of the entire airport?s operations. The airport plans to add additional solar panels in the future, eventually powering all its energy needs and even selling energy back to the local utility company to help power the city. The airport also gets a credit for its clean energy contribution. As the new terminal and solar farm improve the airport's environmental profile, they will also be a boost to Chattanooga's economy. In fact, civil aviation contributes $1.3 trillion to our economy nationwide and generates more than 10 million jobs.